It seems that every year, I become obsessed with yet another member of the Little Wisco group. 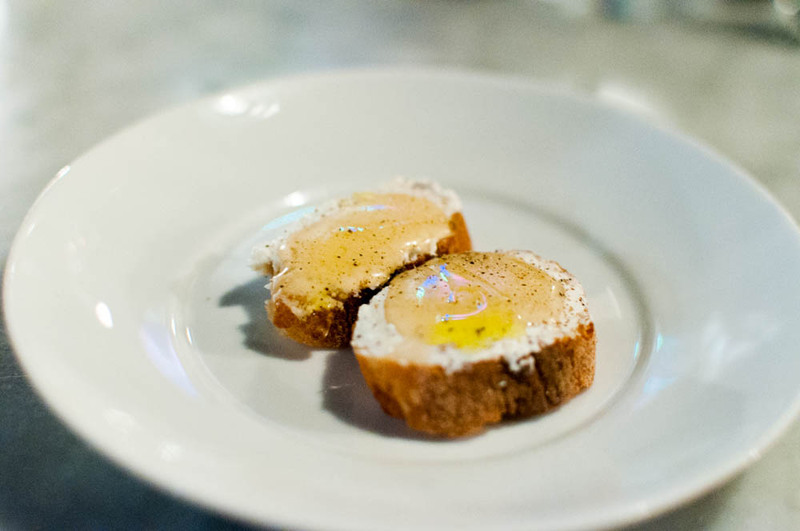 This year, it is Perla, the cozy Italian spot tucked away on the short block that is Minetta Lane. The rustic interior was dark and lit by warm and dim lights, full of leather booths and wooden tables. As a juxtaposition to the old school dining room, a low beat of hip-hop floated throughout, just the right level though so that you can carry on a conversation. My dinners here have always started with a little bite from the kitchen. The deceptively plain toast with ricotta might seem understated but dressed up with a drizzle of floral honey and a sprinkle of black pepper, these were kind of perfect. Moving onto the appetizers, where there were some true stars. Even though grilled octopus seem to be on every single menu lately, the version here at Perla is worth ordering. 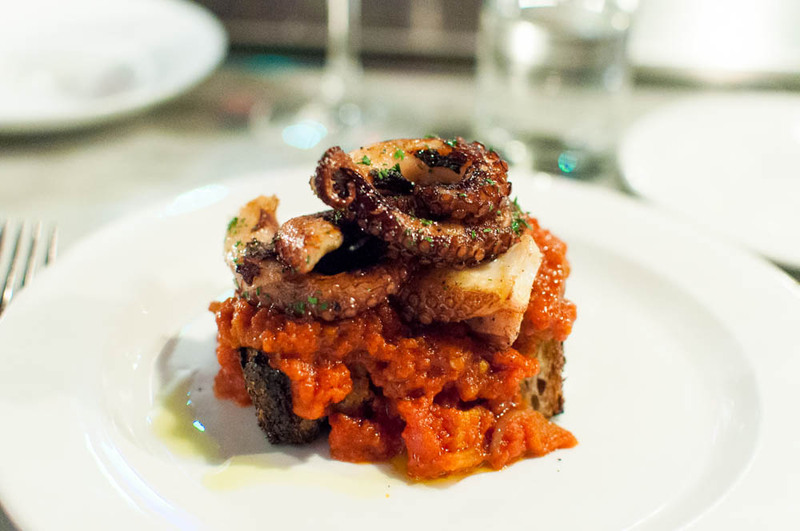 The tender pieces were perched on top of a piece of country toast topped with sweet and tart flavorful blend of eggplant and oven roasted tomatoes. 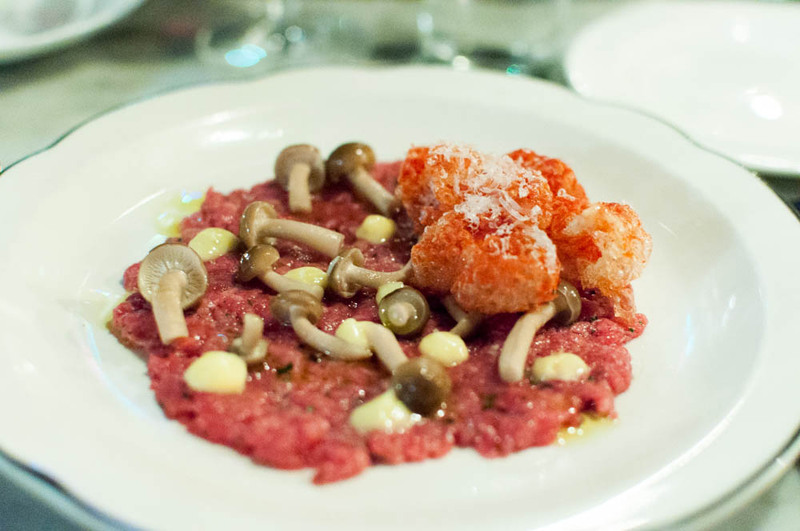 The beef tartare with bone marrow, mushroom and tendon all’amatriciana was a nice rendition on the typical tartare. The pickled mushrooms added a nice bite while the fried tendons added great texture. Even though I lapped up the dish, I seemed to have missed the bone marrow somewhere between the bites. 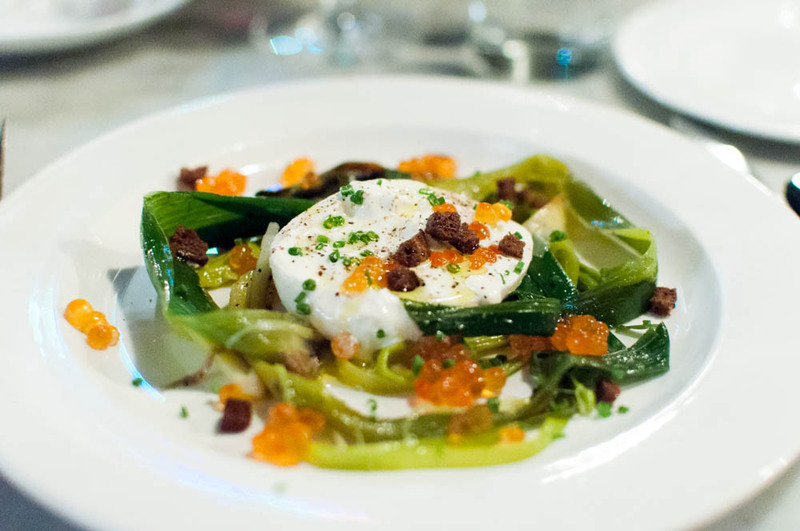 I love burrata and when it’s served with salmon roe, I really can’t resist. With the addition of burnt leeks and pumpernickel, the plate was a combination of all types of texture and flavors. For that night when I was feeling a little adventurous, I opted for the veal tongue. 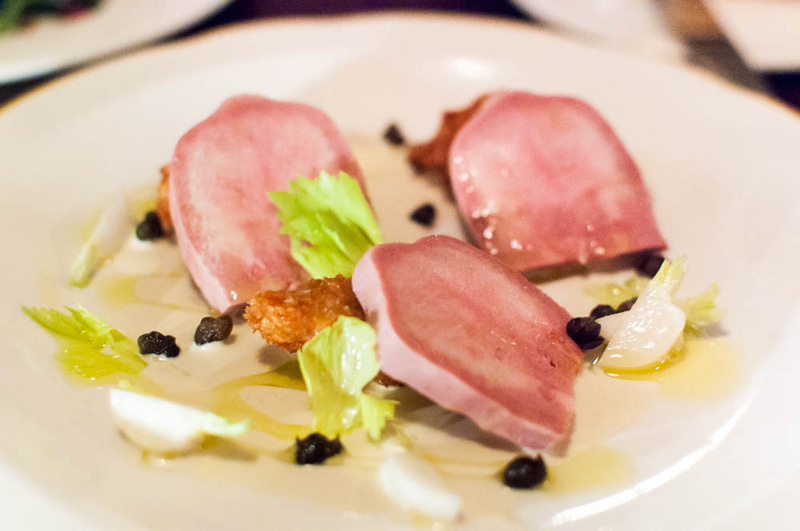 Slices of tender tongue were served with crispy fried sweetbread, capers, Tokyo turnips and tonnato sauce. Another great plate full of fun and unexpected flavors and texture. 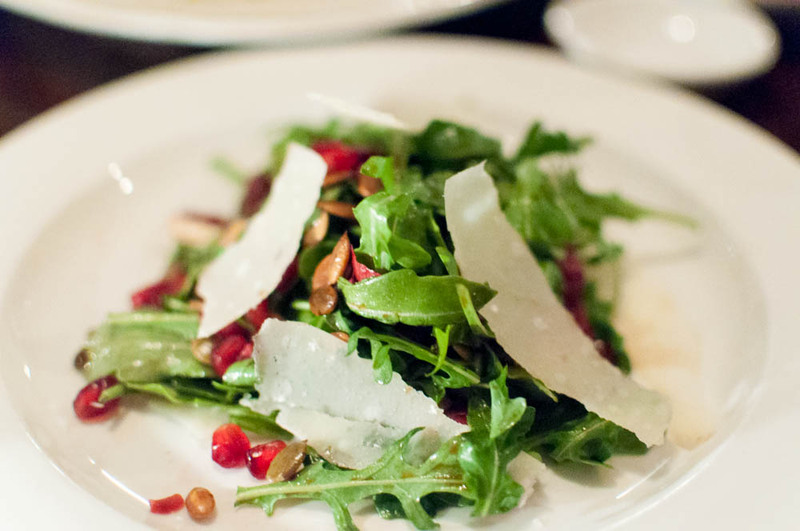 Of course, for those looking for a little green, the arugula salad with pomegranate, pumpkin seeds, treviso and parmigiano was a good starter featuring some autumn flavors. While it is really hard to not get lost in the appetizer section at Perla, you must power through because the pastas here are quite fabulous. 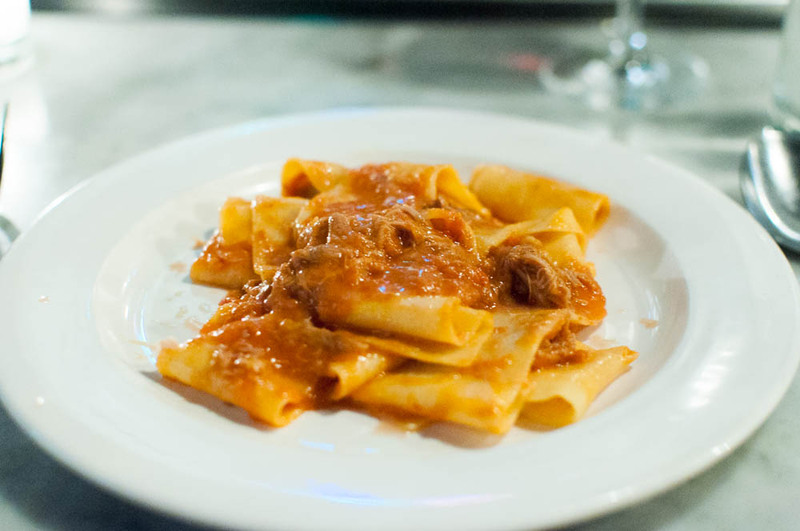 A standout is a rich duck ragu that coated each wide strand of the house made pappardelle. To make it even more unctuous, foie gras is added into the sauce. 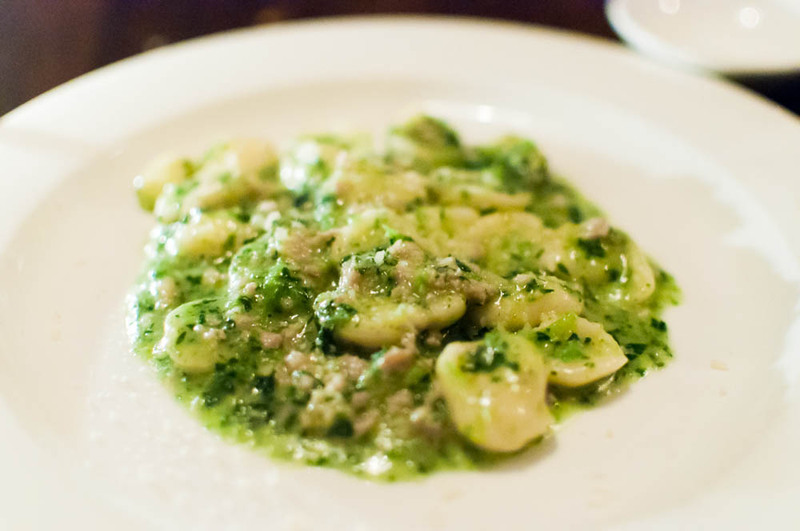 Another favorite was the orecchiette with sweet Italian sausage and broccoli rabe pesto. Each lobe of the perfectly al dente orecchiette was coated with that delicious pesto, made from a blend of broccoli rabe and tiny sausage pieces. Even though I mostly prefer noodles over orecchiette, I couldn’t stop eating until the entire bowl had disappeared. 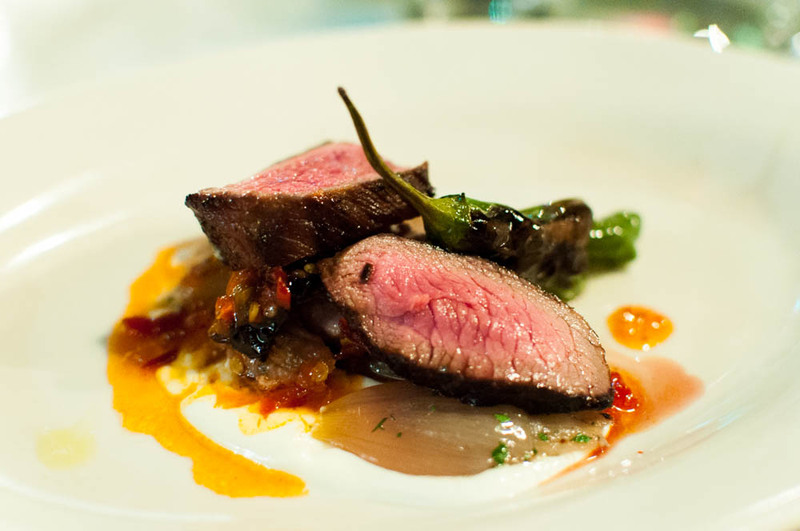 Of the two entrees I was able to sample at Perla, the winner was definitely the leg of lamb and belly with shallots, shishito peppers, yogurt and calabrian chile. The belly was fatty and fork tender while the leg had a nice bite. The yogurt cooled off the mild heat from the shishito peppers and the calabrian chile, creating a great balanced dish. 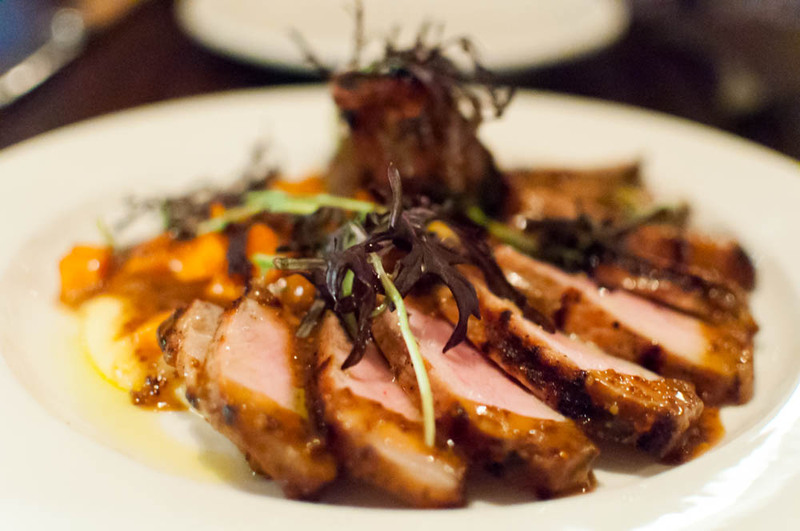 The second entree I sampled was the pork chop with jeweled yam, polenta and grain mustard sugo. While the flavors in the pork chop dish were fantastic, sadly the tough pork pieces left a bit to be desired. Desserts at Perla were kept pretty simple. 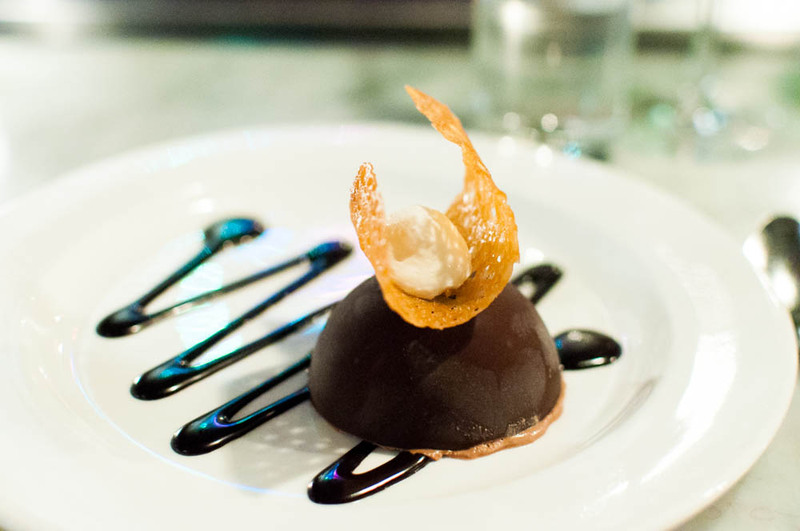 The most intriguing has to be their take on the tartufo. There was no easy way to approach this other than to dig in wherever you can. Once you do crack open the thin crust, the globe of chocolate ice cream will fall away to reveal a fig in the center. 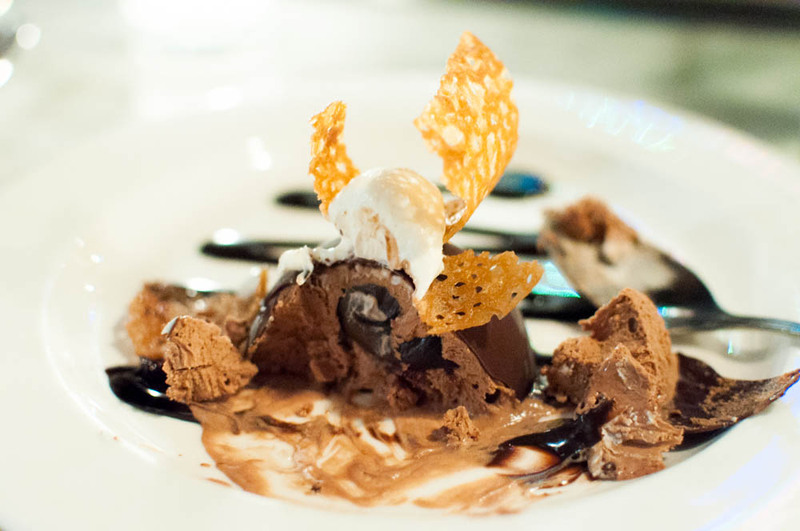 The combination was rich and dark, lightened by the dollop of ricotta and amaretto fudge. Even though I have already visited Perla twice in close succession, I feel like I am ready to return to the cozy spot. I would love to start with one or two of the appetizers and definitely move onto one of their delicious pastas. Perhaps I will save room to explore another main dish there with a glass of wine and end with a sweet bite. There is something about the food and the atmosphere there that just combine to create near perfect experiences and one that I hope will happen time after time again.